After a long day at a Bangkok golf course where is the best cheap restaurant to eat at? Excluding sidewalk restaurants (the topic for another post) here are four places that you should investigate after your next round of golf in Bangkok, all under $10 USD a head, including alcohol! 1. Steak Lao restaurant is on Chang Wattana in Ram Intra, 100 yards from the outer ring road exit. The restaurant is an ideal place to visit after golfing at Panya Indra Golf Club, Legacy Golf Club, Windsor Park or President Country Club. It has a true rustic Thai feel and the sizzling steak Lao dish is fantastic. 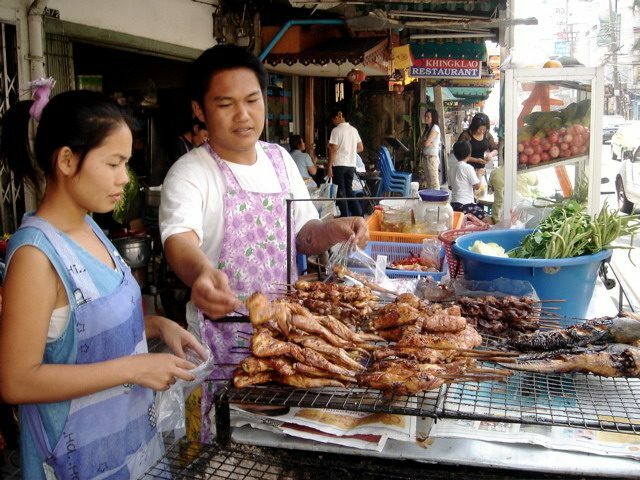 By the way in addition to beef “steak Lao” comes in pork, chicken, and fish. Yes that’s right fish and if you have to ask, well just order one of the other varieties! 2. Via Vie is an Italian restaurant on Soi 8. What better than a pizza and beer after a day at the golf course? Well this jewel of a restaurant has the best wood fired pizzas in all Bangkok, if not Thailand. The other night after dropping off my mates from a round at Thai Country Club, I went into Via Vie for their specialty pizza margarita and a warm spinach salad. Ricardo the owner cooked for me as usual, came over, and we even shared a beer. The total tab, including 2 beers was not even $10 dollars. As an added plus for those golfing at Santiburi Country Club, the original Via Vie is on Chewang beach and is run by Ricardo’s brother! 3. Suda is on Sukhumvit Soi 14, underneath the Asoke sky train station. It has been here for years. Formerly it was frequented by Thais only, but lately it is equally enjoyed by westerners and golfers alike. It is amazing that such a good restaurant could be so cheap. Most dishes are under $2 US and I have never had a bad dish here. The clear Tom Yum (potak) soup is excellent. The cooking is authentic Thai, so be careful if you order something spicy!. 4. Dairy Queen is not an ice cream parlor, nor do they serve hot dogs. But if you want the best fresh seafood in Bangkok and prefer to avoid the over prices tourist traps, then this is the restaurant for you. The food is 100% local and they serve whatever was caught that day. You pick your fish or seafood and tell your server how you would like it cooked (broiled, baked, steamed, deep-fried, Thai style, etc). As an added benefit after a long day at the golf course, this restaurant sits right on the banks of the Chao Praya River and al fresco dining is the norm. There are numerous “beer girls” selling cold draft beer from all the major breweries (Singha, Chang, Heineken, and Asahi), which makes for nice sights if you tire of wathing boats go up and down the river. Price wise, Dairy Queen may be over the budget at $15 USD a head, but who is keeping track! I would welcome any feedback on these restaurants should you decide to give them a go next time you are in Bangkok, which I really hope you will. And, I would especially welcome any other suggestions from seasoned Bangkok golf vactioners. I am always looking for other places to try!